The fifth anniversary of London Fashion Week Men’s (LFWM) started on the same day as the UK’s general election, which has left the country in turmoil as it battles with the horrific tragedies of recent weeks. Add to that the absence from the LFWM schedule of some of the big names including J.W. Anderson, Casely-Hayford and Agi + Sam, and it seemed that this season had the odds stacked against it. But Londoners are a stubborn lot and have a long pedigree of resilience in uncertain times. Indeed strife can be a catalyst for artistic expression and creativity, helping to ensure that this historic home of menswear had something to say. Whether it was Vivienne Westwood sitting on an acrobat’s shoulders wearing a t-shirt that read ‘Mother fucker’, Charles Jeffrey’s Loverboy Victoriana club kids extravaganza, or Martine Rose’s ode to the Everyman (and Jeremy Corbyn) in a climbing gym in Tottenham, LFWM was anything but boring. Here we feature some of the designers who inverted the mood to produce awe-inspiring SS18 collections. Working with the concept of Inevitable Interaction, Kang Don Jun, creative director at D.Gnak, made his LFWM debut with a collection dedicated to the ethereal harmony of the yin and the yang. Bringing together tailoring and sportswear with laces, buckles and zips, a black and white palette formed the foundation from which came punctuations of colour. Firstly, beige suits were loosely tailored to the torso and worn with trousers stopping on the calves. These were followed by mustards and yellows on long bomber jackets and apron trousers, and finally there was a bold pop of red on a quite magnificent oversized batwing anorak with open zippers at the back. This was the burst of urgency needed to round off a brilliant collection. Craig Green cemented his status as one of the very best British menswear designers this season. Staying true to his highly conceptual, sculptural aesthetic, he offered a new vision of “a constructed paradise.” While simple denim jeans and ribbed and knotted separates were on the wearable side, the show came alive with hooded jackets, capes and fringed coats covered in bold prints creating vivid landscapes in reds, oranges, pinks and yellows. Textures were created with a method involving a complicated manipulation and stitching of cotton and cord. And topping it all off were “walking alterpieces” – wooden frames covered with fabric and worn around models’ necks and bodies - a collaboration with Green’s long-time friend David Curtis-Ring. This season, creative director Arashi Yanagawa took the idea of a new age post punk hero and cogently presented a cohesive collection that was on-trend while also spoke to eras past. High-waisted, voluminous trousers, skinny ties and sleeveless blazers with big shoulders that ran large on the body all conjured up 1980s power dressing at its best. Meanwhile Demna Gvasalia’s first Balenciaga men’s collection came to mind when looking at the disparate mix of layered sports pieces, skinny shorts, check shirts and bother boots. 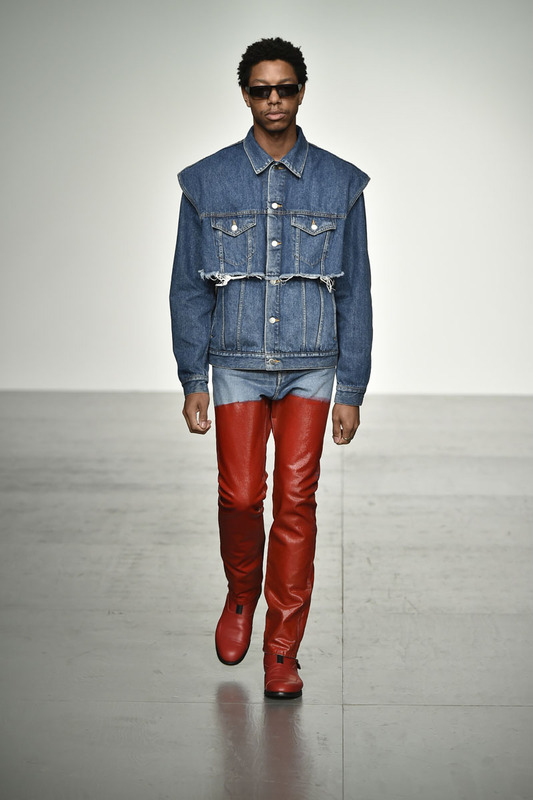 Perhaps the stand-out look of the show was a treated red leather coat and matching leather trousers, with the workings on the leather lending a whitish chalk tint that made it look at once fresh and yet well-worn. Zio Song, founder and designer at Songzio, begins each season with paint on canvas, thus informing the brand’s signature brush stroke motifs. 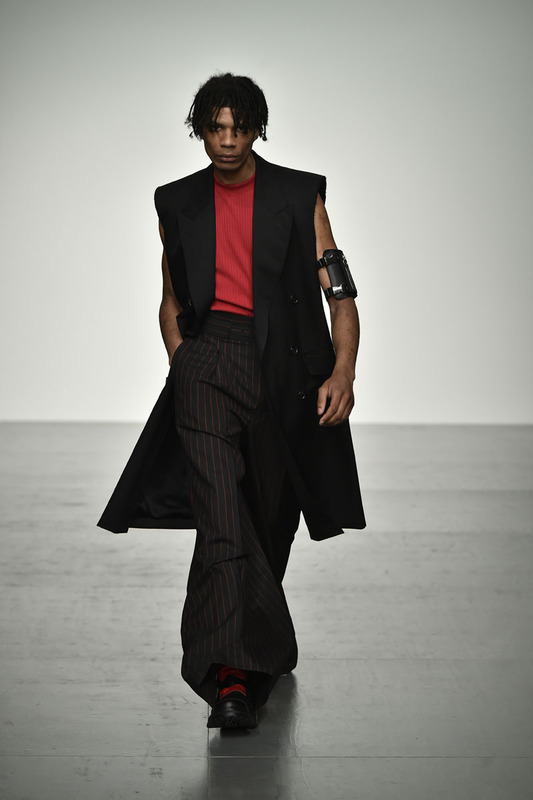 SS18’s protagonist was a “man, in his night, searches for his own light.” Looking to own his emotions, at first they were fiery with bold horizontal stripes in orange and blue on jackets and shorts and with studded red leather featuring prominently. And then calmness fell in the form of softer striped shirts, and black and white suits stopping mid-calf on the trousers and tapered jodhpurs with button detailing. 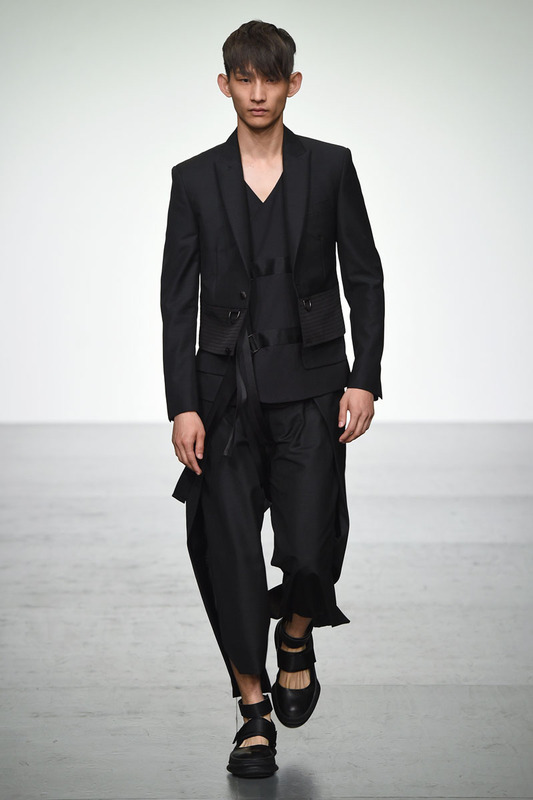 Speaking to the designer backstage after the show, he referenced Indian influences in the Nehru-collar jackets and elongated shirts while still staying true to his design ethos of East Asian minimalism. That is a potent mix if well executed, which it certainly was. For his second outing at LFWM, Tinie Tempah showed a remarkable development in the brand’s offering. Presenting the collection on a custom-built basketball court, his diverse cast of models proved you can actually play sports in the pop star’s take on streets luxe. The greatest innovations were in the fabrications however. So out came a fury wool cardigan in a powder pink; a matching shorts and boxy shirt made of moulded polyester in popping peach, a chocolate brown PVC jacket and deep blue corduroy trousers. A slam dunk of a show.